Andrew and I were over three months into our European adventure, so I guess it was about time for us to go complete hobo. We had come close a few times – tenting in wine fields on a Grecian isle, camping on some farmer’s terrace in Italy and eating little but unrefrigerated, hardboiled eggs for a week straight. But, we had yet to actually sleep out on the street. A December night in Southern France seemed like a good time to start. 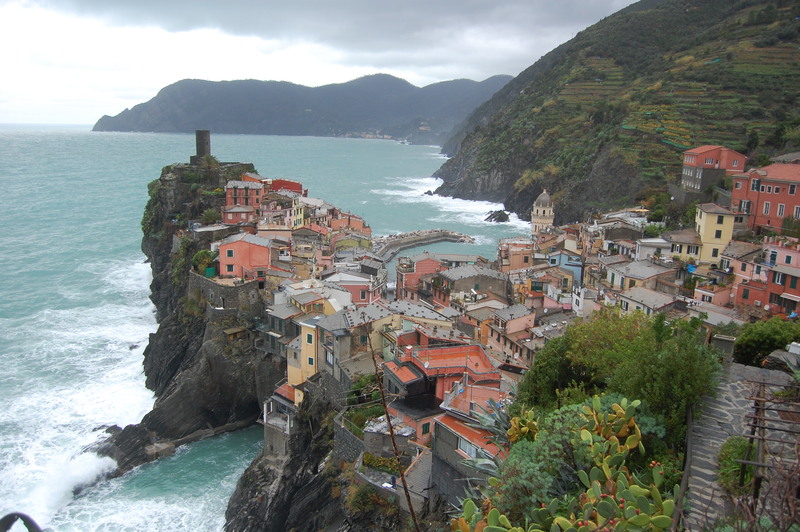 After two rainy days in the Italian wonderland of Cinque Terra, we wanted to make it all the way to Barcelona, Spain – a considerable distance by rail. We had no internet access to check schedules, so one morning we gathered our belongings and just got on a train heading west. The trip took much longer than we anticipated. With long waits at each station, we didn’t reach France until after nightfall. 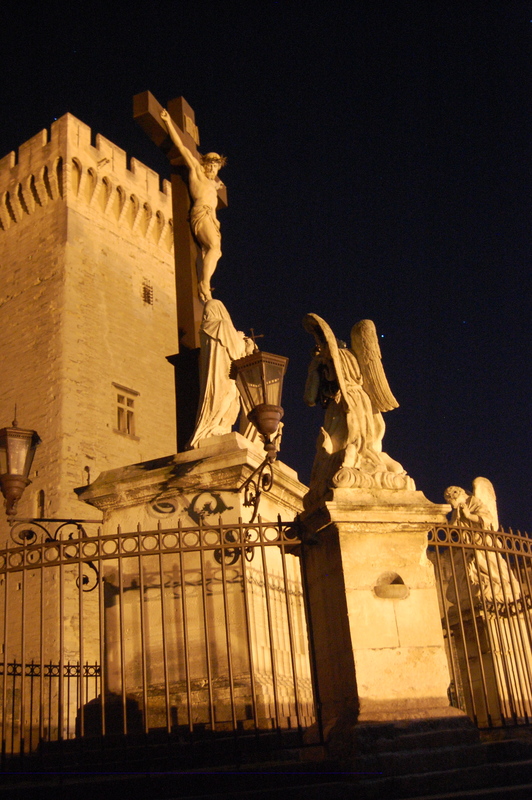 When we arrived in Avignon, it was midnight. Sleepy-eyed and irritable, we checked the departure board. The next train to Barcelona left at 6 a.m. In fact, no trains left until that time because the entire station was closing. So Andrew and I, along with the other street rats, were ushered out of the station and into the chilly winter night. Outside the terminal, we stood at the edge of one of the great ancient cities of France. I had been there a few years before with my family in the summertime. Shops sold art and fine wines, a giant carousel delighted children in the main square, happy tourists dawdled about and people sat and drank in happy excess outside crowded cafes. But the town we saw on this night was very different – doors and windows were shut up, the curbside cafes were void of life and the streets were cold and empty. 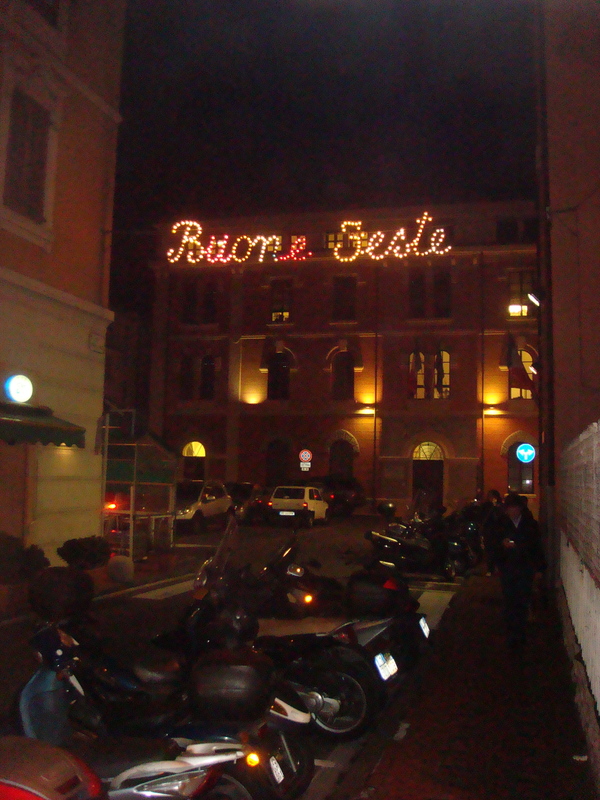 The only signs of human occupation were large industrious street-cleaning machines and a fabulous array of Christmas lights, draped between the buildings and hanging above the streets. We had no idea where the city’s hostels were, if they existed at all, and weren’t looking for them regardless. Neither of us wanted to pay 15 euros for 6 hours of lodging. Instead, we decided it best to find someplace outside – a bench, dark alley, half-empty dumpster, etc. – to spend the night. Not far from the train station, Andrew located option #1. It was a stairway, which led below ground and dead-ended at a locked door. The area was marginally clean and reasonably spacious with warm air radiating from the door. The only problem was it also looked like a place from where a janitor might emerge; a man that would surely be covered in grease stains, cheap wine and despair. 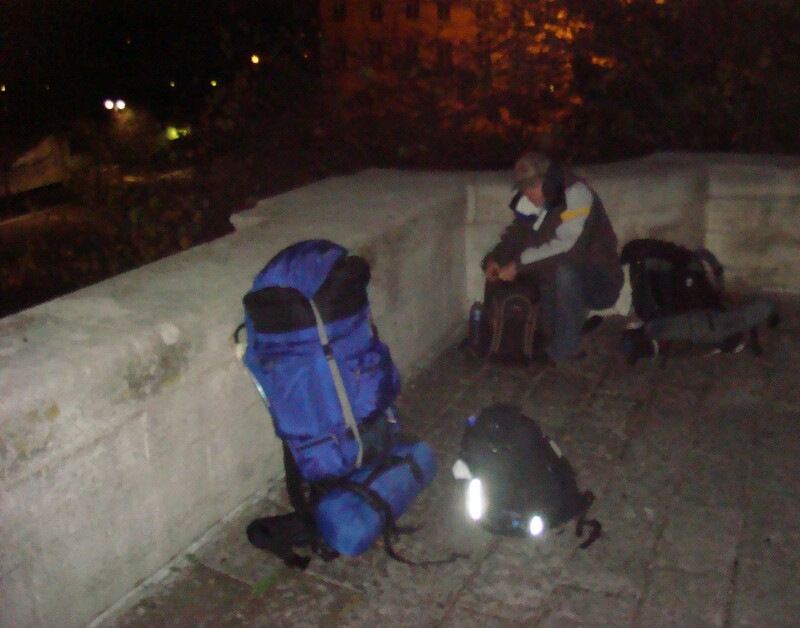 Not wishing to get a swift mop to the ribs at 4am, we grabbed our packs and continued our search. Soon we came upon the main square. Thousands of lights were strung overhead, illuminating a little Christmas shop village below. We snooped around this enchanted township with an interest made up of one part admiration, two parts desperation. Alas, all of the garland-covered retail huts were boarded up and locked. The novelty of being alone in a vacant, but beautifully lit medieval city was wearing off. By this point, we simply wanted a place to sleep where the odds of strange men doing horrible things to Andrew was low. As we trudged on, circumstances grew more frustrating with every labored step. It was coming on December 25th, the night was getting late, we were tired from our journey, Andrew was with child and we could find nowhere to stay. And we didn’t even have a donkey. Within twenty minutes of wandering, we came to a vast empty square. At the far end of the space stood the largest gothic cathedral in Europe. It was an imposing structure, rising several stories over the neighboring buildings. It looked as if a church had once tried to swallow a castle, but gave up halfway into the endeavor. As we approached, the fortress grew in the night sky until it loomed over us. We followed a wide stone path, which ascended along its southern wall, to a raised stone courtyard that overlooked the square. The entire prominence was incased in a low stonewall. At its center was a commanding statue of the crucifix. In the far corner was an ideal spot for a good night’s sleep. After a brief survey of our surroundings, we dropped our packs and began setting up. 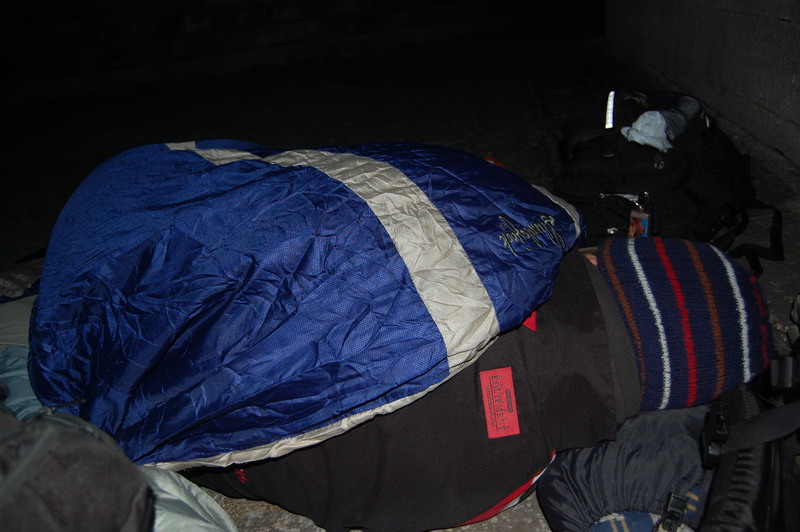 I watched Andrew put on all his winter layers before attempting to wedge his long body into his sleeping bag. He seemed to only make it in about three fourths of the way, leaving much of his upper body exposed to the frigid French air. This is probably why he didn’t sleep well. I put on a beanie, scarf, heavy socks and wormed my way into my bag. Then I looked up at the cross towering above us. The lifeless face of Christ was tilted down and favoring his right shoulder. Had his eyes not been closed, he would have been staring right at us. I found this to be eerie, and yet strangely comforting: an odd mix of emotion, I know. But, I couldn’t help but have the creeping image that I was going to wake up at some point in the night only to see Jesus staring wide-eyed back at me, an occurrence that would have surely caused me to evacuate my bowels, jump the wall and leave Andrew to face judgment alone. But I also felt comforted and had faith in our mutual agreement – I wouldn’t pee anywhere near the church and he’d wake us up if any deviants tried to attack. As I entered that hazy limbo between consciousness and sleep, a loud noise echoed off the cathedral. I first looked to Christ for a sign. But he was still sleeping. I sat up and peeked down on the square just in time to see a few dark figures dash back into the shadows – zombies no doubt. I ducked back behind the wall hoping they hadn’t seen me. A few minutes later I peered down at the square again and saw no sign of them. Satisfied, I nodded a thanks to Jesus for scaring them off, curled closer to Andrew and laid my head down on a bag of dirty laundry for a surprisingly restful three hours. 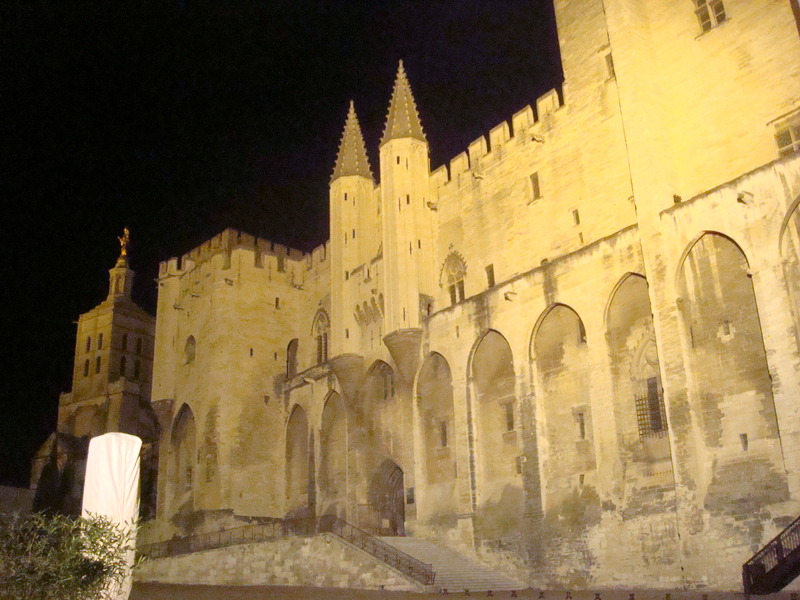 I’m not sure how we were able to sleep undisturbed outside one of the grandest cathedrals in Europe, especially given that Avignon seems like the type of affluent city that prides itself on keeping street urchins like Andrew and I away from its holy points of interest. Maybe the idea of two young people having a sleepover with Christ is so ridiculous that it’s not seen as a security priority. Or maybe the Son of God really did watch out for us. Then again, Andrew and I really weren’t the best candidates to receive righteous protection. So, maybe our successful debut as European hobos just came down to luck. That, or we looked too pathetic to rob. The first photo is gorgeous!! The one of Andrew is sad. By far the most unpleasant night of sleep I had in Europe. Woke up every 20 minutes due to extreme pain caused by the freezing air. The gothic statue of my boy Jesus was beyond words. Creeped me out every time I opened my eyes.